I haven’t seen my favorite workout partner/best friend from college since we took a trip to Hilton Head Island back in May. She just moved back to Knoxville to finish her undergrad and we have both been counting down the days until we are reunited. Since there is virtually no parking on campus unless you are a student or faculty member we had thought about doing a quick five mile walk on the greenway off campus but the morning of our reunion she texted me to see if I wanted to check out Jump Jam. 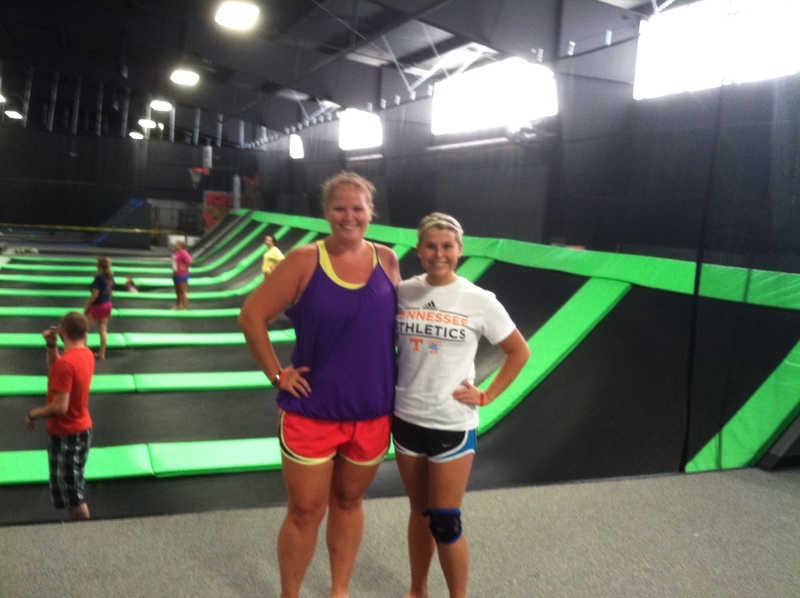 Jump Jam is a new trampoline park that just opened up in Knoxville and is crazy popular. The place got over 20,000 Facebook likes before they even opened their doors. I’m not a huge fan of super crowded places especially when it comes to working out so I had just planned on going once the newness wore off. Since we were going to go during the early afternoon on a school day we both assumed that it wouldn’t be that busy. Thank goodness we were right. Jump Jam charges 12 bucks for an hour of jump time and people get to start jumping every thirty minutes. We got there, signed our waivers, and paid around 1:15 so we had about fifteen minutes until the next jump session started. Lucky for us the attendant let us go on in so we ended up getting in an hour and fifteen minutes of jump time which is way more than enough. When you first get into the arena it is a little overwhelming with the huge amounts of trampolines. 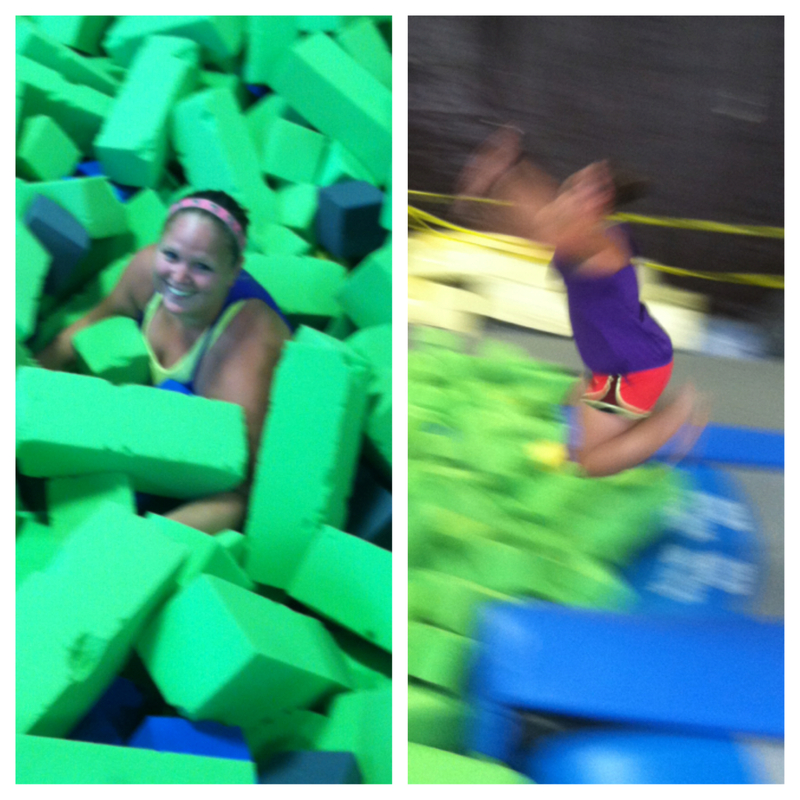 We went to the foam pit first since no one was there and oh my goodness it was probably the hardest thing ever. I got up on a three foot step, jumped down onto a trampoline launch pad, then sprung like Superman in the air and sunk to the bottom of the pit. Getting out of the pit took about three minutes and was a really intense workout. Looks easy but it is so hard. We did this over and over and over again getting better as time went on. After we had our share of foam pit action we hit the dodgeball room. I’m one of those girls in dodgeball who just stands in the back and somehow is always the last one in. We just goofed around in there and Jess and I avoided getting hit by her boyfriend. Then the real fun began. We got on the actual trampoline pods and went to town. We bounced from one to the other and all around the room. We stayed on individual tramps and did all sorts of tricks. I did a few toe touches and just regular ungraceful jumps. The amount of photos we all took of each other is slightly embarrassing but it is so fun to capture someone as they are in mid-air defying gravity. So much fun! The entire time was one big sweat-fest. I wish I had worn my heart rate monitor and saw how many calories I burn because I guarantee it was a bunch. Like I said, an hour is plenty of time to jump and we had fifteen minutes more than that. By the end of our session I could feel my legs and heart getting pretty tired and I knew that I would be sore. It was probably one of my favorite workouts to date and the best part is that you didn’t really think about working out since you were having so much fun. On our way out the door we inquired about fitness classes. 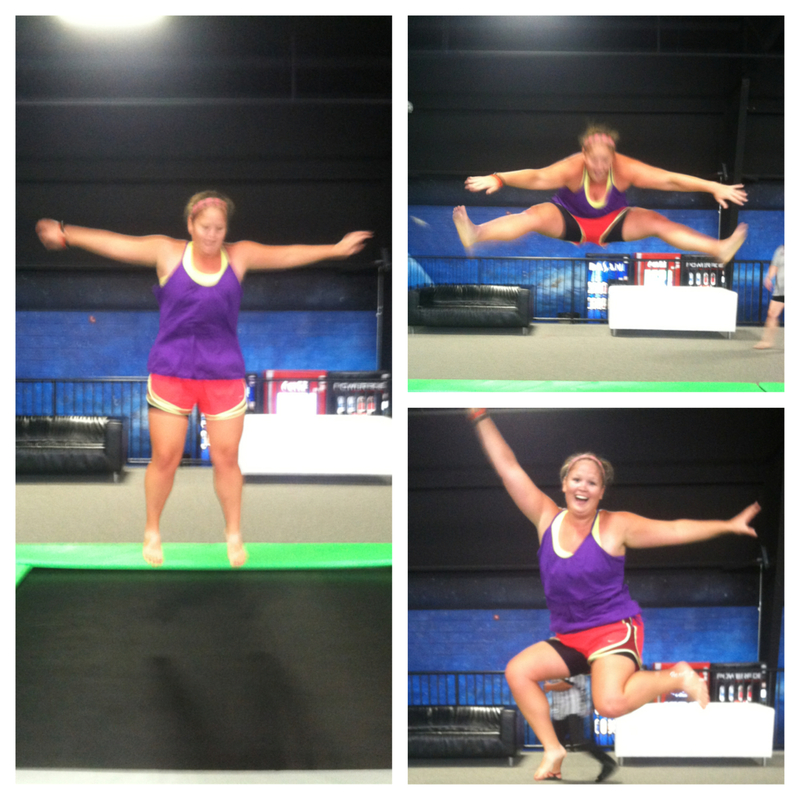 In the near future Jump Jam will be offering fitness classes on the trampolines. I’m definitely thinking that we will be back for a few of those. If I could get that sweaty and sore by doing random things on my own then I can’t imagine how awesome my body would feel after a structured workout. That night I was incredibly sore and my legs and shoulders were so tight. I met up with my friend Yvonne to do a three mile walk and tried to walk out some soreness. It worked for the most part but two more days have passed and I can still feel some tightness in my legs and shoulders. That’s a sign of a dang good workout, right? I would recommend Jump Jam to anyone! It was fun, clean, and I totally got my money’s worth. Although I haven’t been when they are crowded, I can imagine it is obviously more fun with less people so if I go again I will probably do an early afternoon. I’m thankful that I got to catch up with Jess while getting a good workout in and having fun. 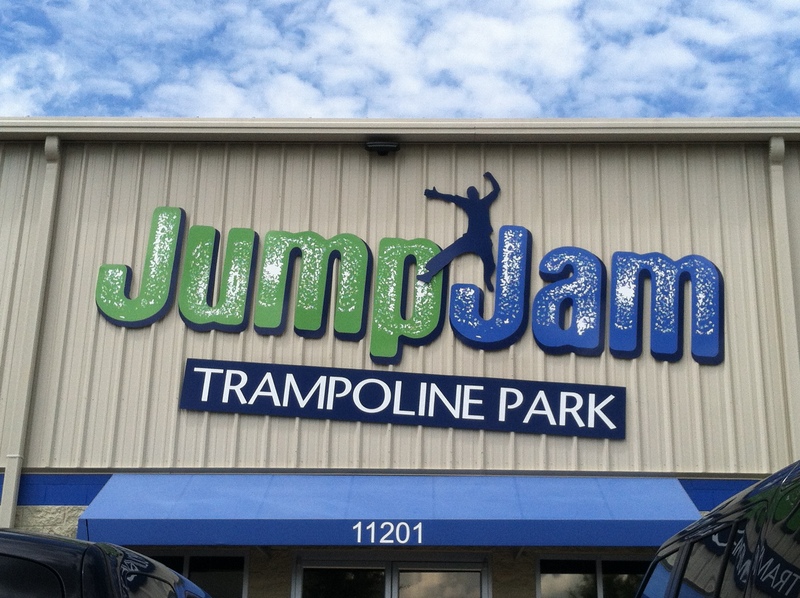 This entry was posted in Workouts and tagged jump jam, jump jam knoxville, trampoline park, trampoline workout by thegogirlblog. Bookmark the permalink. Find one and go to it! I promise you won’t be disappointed! I’ve always wanted to go to a place like that! Looks like so much fun. Love the action shots! I want to go there!!! That is so awesome! Wow!!! That looks like so much fun!!! I used to be scared too when I was younger (heavy person on a trampoline=bad idea) but this park was so fantastic! I had not either until this one got built. If it makes you feel any better, I now have a nagging ankle pain that I am contributing to so much jumping. Still fun, though.